US equity REITs can be split into two broad categories: traditional and specialty REITs. The traditional REIT sector is predominantly made up of the "Big Four" sub-sectors: retail, industrial, residential and office. 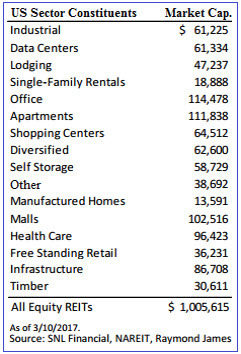 These sub-sectors have performed well since the lows of 2009, but it is specialty REITs that have overtaken the pace at which growth is being achieved by these different sub-sectors of the listed real estate market. Specialty REITs own and manage a unique mix of property types and collect rent from their tenants in the same way that traditional REIT managers do. The types of properties owned and managed however, differ from that of the "Big Four" sub-sectors. Examples of properties owned by specialty REITs include golf courses, data centres, cellular towers and self-storage facilities. 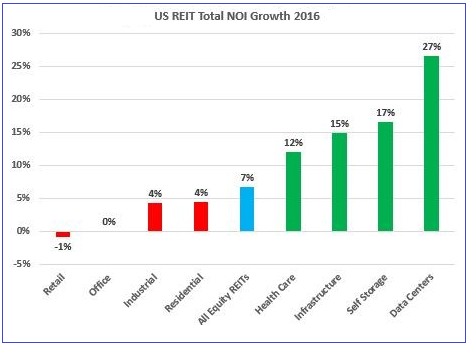 Although these four sub-sectors only represent 30% of total US REIT NOI, this group claimed over 60% of the total NOI growth for 2016. The majority of traditional property REITs in the US currently find themselves experiencing the mature phase of the industry cycle, to a greater degree than their non-traditional peers. Growth from accretive acquisitions are more difficult to come by, particularly at the volumes required to really move the needle. Specialty REITs tend to be smaller and more nimble than traditional REITs, and are benefiting from growth off a relatively lower base. Another factor that is playing into the hands of specialists is demand. For example, data centre REITs appear to be riding the wave of rapid growth, and in many cases cannot build their facilities fast enough to keep pace with the insatiable demand for their services. The operating trends are not as exciting when one takes a look at the apartment and hotel sectors (more traditional property types). In addition to the lukewarm demand, pockets of oversupply in some areas have led to a decline in rental growth expectations for 2017. One of these pockets is Manhattan, where last month (February), rentals declined for the first time in four years across all sizes of apartments. This after a construction boom brought more buildings online. Diversified REITs make up roughly 6% of US REIT market capitalisation. A diversified REIT is a company that owns a variety of property types and has over time become a smaller and smaller part of the market. This has happened as REIT managers, by-and-large, focus on their core competencies and manage portfolios of similar types of assets for strategic and tactical reasons. Often a particular skill set is required to effectively manage a specific property portfolio, and keeping within one’s area of expertise rather than "diworsifying" (borrowing from the great Peter Lynch) allows the REIT manager to extract maximum value from their assets. When managing a facility like a top class data centre, "know-how" is paramount. The sheer scale of these properties, the cooling requirements, back-up electricity infrastructure and Fort-Knox-like security make this sub-sector of property unlike any other. Within a sub-sector however there are always winners and losers. For example, a data centre REIT like CyrusOne is able to build their facilities at a lower cost than their competitors, giving them a significant competitive edge. They are also best-in-class when it comes to the time it takes to bring a new facility to the market. Sub-sector picking then, only gets an investor so far - a deeper understanding of the individual players is essential. At Reitway Global, we are benchmark agnostic, Growth at a Reasonable Price (GARP) stock pickers. We are experienced at picking growth stocks and have a strong track record investing in specialty REITs.